Some thin wall Welded Pipe up to 25.40 mm (1.000″) can be supplied. We are Manufacturers & Suppliers of Thin wall stainless steel 321h Welded pipe in India. Looking for trusted dealer & distributor for 321h Welded Thin wall pipe in India? Information for those interested in buying Thin wall 321h Welded pipe. India’s Largest stockholder of SS 321h Thin wall Welded Pipe offer best price in India. We are Manufacturers & Suppliers of ASTM A312 TP321h Stainless Steel Welded Polished Pipe. Looking for trusted dealer & distributor for ASTM A312 TP321h Welded Polished Pipe in India? Information for those interested in buying 321h Welded Polished Pipe. India’s Largest stockholder of SS 321h Welded Polished Pipe offer best price in India. We are Manufacturers & Suppliers of ASTM A312 TP321h Stainless Steel Decorative Welded Pipe in India. Looking for trusted dealer & distributor for 321h Welded Decorative Pipe in India? Information for those interested in buying SS 321h Welded Decorative Pipe. India’s Largest stockholder of 321h SS Welded Decorative Pipe offer best price in India. ASTM A312 : Welded and straight-seam welded austenitic pipe intended for high temperature and general corrosive service. Filler metal not permitted during welding. ASTM A358 : Electric fusion welded austenitic pipe for corrosive and/or high temperature service. Typically only pipe up to 8 inch is produced to this specification. Addition of filler metal is permitted during welding. ASTM A790 : Welded and straight-seam welded ferritic/austenitic (duplex) pipe intended for general corrosive service, with a particular emphasis on resistance to stress corrosion cracking. ASTM A376 : Welded austenitic pipe for high temperature applications. ASTM A813 : Single-seam, single- or double- welded austenitic pipe for high temperature and general corrosive applications. ASTM A814 : Cold-worked welded austenitic pipe for high temperature and general corrosive service. 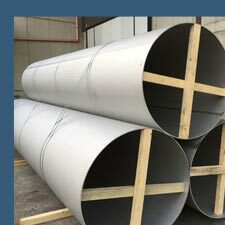 Range of Stainless Steel 321h Welded Pipe according to ANSI/ASME 36.19M - 321h SS Welded Pipe. ASTM A312 TP321h Stainless Steel Welded Pipe as per #4 Polish, #6 Polish, #7 Polish or a #8 mirror finish. Stainless steel polished pipes can also be cut to size. Bevel ASTM A312 TP321h Stainless Steel Welded Pipe to prepare for welding or other processes. In some cases, UT testing of the stainless steel Welded pipe and tueb may be required. We can assist you with this requirement. Above table represents that we keep in stock 321h Welded Pipe, SS 321h Welded in form of Pipe. Other sizes can be made available on request.